This is our last week of school! I can hardly believe the end is in sight. Boo-Boo actually finished up on Friday, but the girls have 4 more days. This week is filled with lots of fun activities for them and end-of-the-year parties and such. I've been the room mom for both girls' classes this year so it's my responsibility to get the teacher gifts for their birthdays, Christmas and now for the end-of-the-year. When I was teaching I always loved gift cards so I used the money we had collected for gifts at the beginning of the year and got the teachers gift cards to their favorite stores. I figure this way they can go shopping and think about their sweet students at the same time! Along with the class gift, I also always give individual gifts from our families. These teachers have gone above and beyond all year long. They spent countless hours with our kids and played such a huge role in their lives for the past 10 months. We truly lucked out in the "amazing teacher" department this year and while I'm excited about summer, I'm sad to say goodbye to these teachers. My monogram machine has been running non-stop over the past week. I've had so many customers bring me teacher gifts to personalize and it has been fun to see the variety of things people are doing for their teachers. There have been a lot of monogrammed cosmetic cases and tote bags, which I love and I know the teachers will, too, but I've already given these items as gifts throughout the year for various occasions, so for ours I decided to do a summer themed gift. 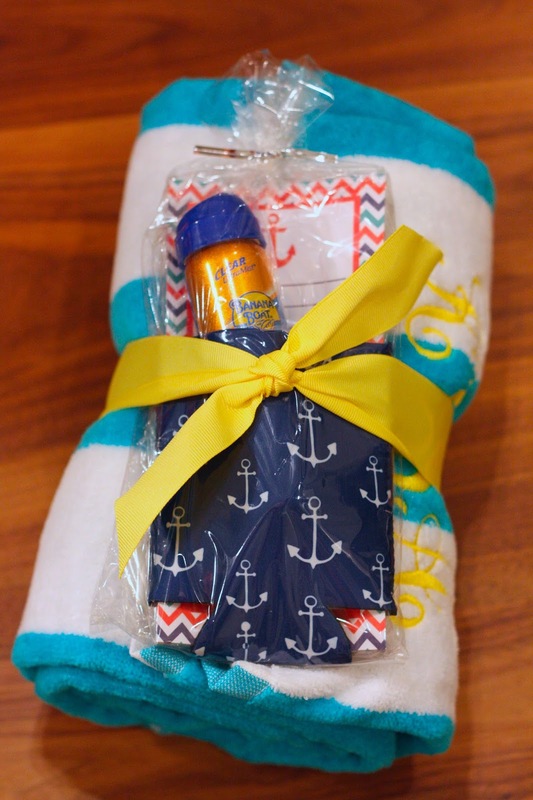 I monogrammed beach towels for each of them and found a few other little goodies to go along with it - a koozie, nautical notepad, and sunscreen. After wrapping everything up nice and cute I'm so happy with the way these gifts turned out and I hope the teachers will love them, too. 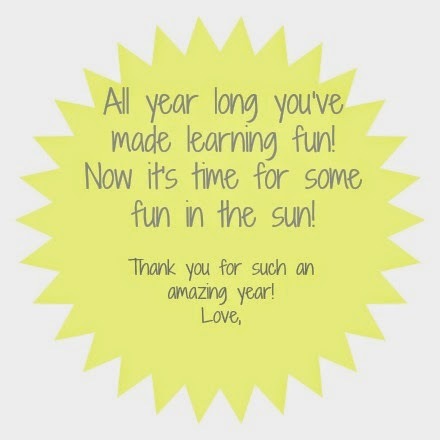 What are you doing for teacher gifts this year? Anything fun or creative? We're always looking for ideas so let us know! I am so impressed with your monogramming skills. And I'm envious! Cute gifts!